Omaha Door & Window Co. is proud to be an Albany Door Systems dealer for high speed and fabric roll up doors for the state of Nebraska and Pottawattamie county in Iowa. 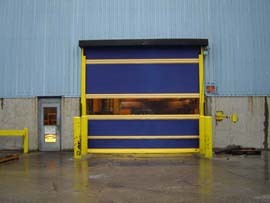 In 1968 Albany Door Systems manufactured the first high-speed door in the Nordiskafilt plant in Halmstad, Sweden. This door featured Albany fabric for the door panel, a counter balance system and an innovative pulley system. This counterbalanced tensioning system kept the door material stretched when shut and allowed the door to open and close quick. With this new idea, the first “rapid rolling” doors and a whole new industry was born. Now, over 40 years later, Albany Door Systems Rapid Roll® Doors can be found in thousands of facilities in more than 60 countries. In fact, Albany now has more than 100,000 door installations worldwide including paper mills, automobile manufacturers, pharmaceutical and food production facilities. Doors are now manufactured in the United States, Sweden, Germany, Australia, and China. Albany Door Systems is the worlds leader in high- speed industrial door sales. In 1995Albany Door Systems acquired Kelley Door Systems, in 1999 acquired M & I Door Systems, and in 2007 acquired R-Bac to expand its product lines. Designed specifically for High Traffic in either Interior or Exterior Heavy Duty Applications. Opens at up to 60 inches per second. Blue or Yellow color standard. Full width vision panel standard. Perfect for Commercial and High Security Applications where Speed is Important. Opens at up to 80 inches per second. UltraEasy Aluminum Slat Design allows for Easy Slat Replacement. Patented Stack-Free design prevents metal-to-metal contact which Reduces Excessive Wear and Noise. 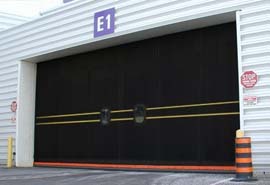 CarGuard Safety System protects up to 6 ft high on both sides of door. UltraLift Belt Design Eliminates Hinges and Rollers. Fewer parts means Less Maintenance. 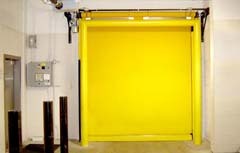 The World’s Toughest High Speed Rubber Door provides Dependable Performance for rugged industrial applications. 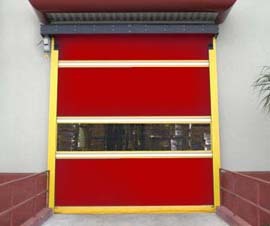 2-layer SBR-Rubber Curtain with high tensile strength Polyester Fabric center weave. Continuous Windlock Design withstands winds up to 135 mph. Springless Design with Direct Drive Motor reduces maintenance cost. High Traffic Sanitary Applications where Environmental Control and Hygiene are Critical. Speeds up 60 inches per second. 40 oz Vinyl Panel material with pocketed Aluminum Ribs. Two piece Stainless Steel side column allow for Easy Cleaning. UltraGuard Safety System protects up to 6 ft high on both sides of door. Designed for High Traffic Cold Storage Applications. Speeds up to100 inches per second. Optional Visibility: 17” or 24” square windows.